Well, this series has taken a while to wrap up! What can I say? When it rains, it pours. 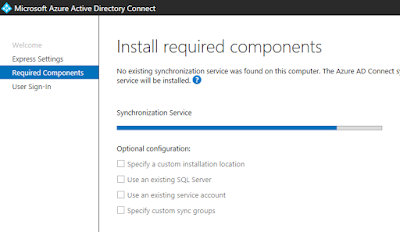 So far, we have taken a look at setting up Azure AD Connect for synchronization in a Hybrid environment using Express Installation, and we followed that up with a look at setting up synchronization and SSO with AD FS, which of course was a bit more complicated. 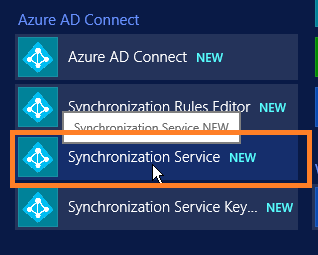 Now we move on to a couple of the advanced synchronization features that require Azure AD Premium licensing. 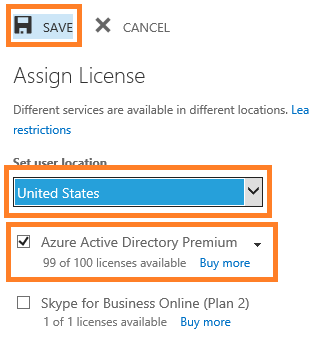 As you can see, there are some very cool perks with using Azure AD Premium licensing. Check out this link for a more in-depth comparison of the feature sets between Azure AD licenses, and price comparison: http://azure.microsoft.com/en-us/pricing/details/active-directory/. Obviously, you can go out and just purchase Premium licensing if you want to, but for the purposes of this tutorial, I was just testing and demonstrating, so I took advantage of the 30 day trial that was available. 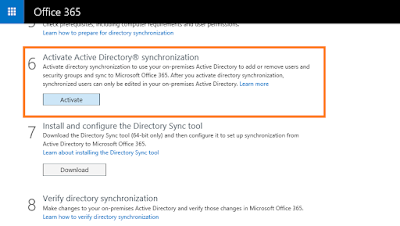 To do this, you can log into your Admin Portal for Office 365, and then towards the bottom of the left-hand navigation menu, under the Admin menu item, click on Azure AD. This will open up the Azure AD portal. 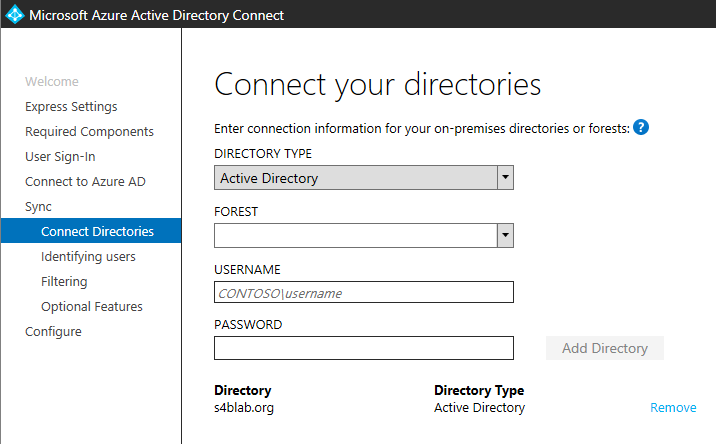 From here, you will click on the ACTIVE DIRECTORY tab on the left side of the screen, and then click on your AD instance name. In my case, this was "The MS UC Guy". 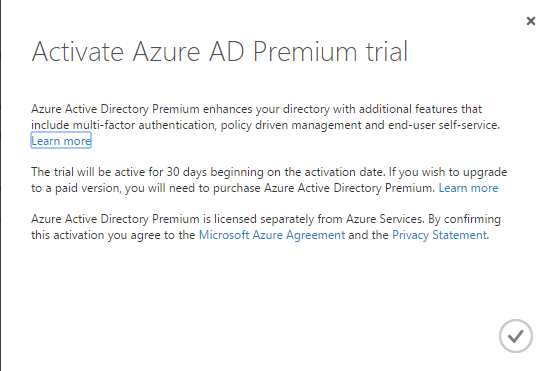 You will now see the below screen, and as you can see, our Trial awaits with the TRY AZURE ACTIVE DIRECTORY PREMIUM NOW link button at the top of the screen. Click on it. 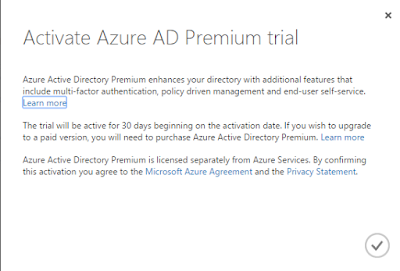 You will then be prompted to agree to the terms of the Azure AD Premium trial in the Activate Azure AD Premium trial box. Click the check mark button at the bottom-right of the box. After accepting the terms, you are brought back to the main Active Directory screen, and you can see that your Premium trial is being activated. 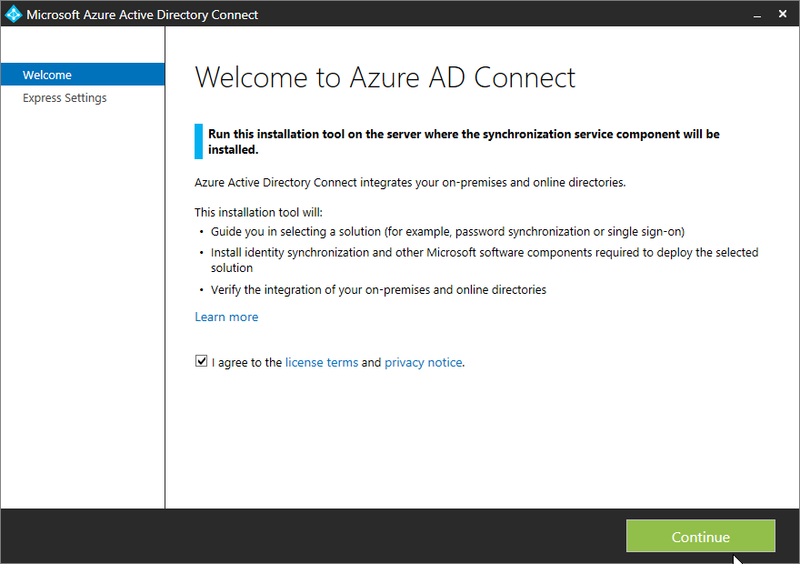 Once your Premium licensing has been activated, it is time to go to your server that has been setup to run Azure AD Connect. Let's take a quick moment to look at what our On-Prem environment looks like. I am using the same Office 365 tenant that I used in my previous posts, using only Skype for Business Online Plan 2 licensing, and now the Azure AD Premium licensing. 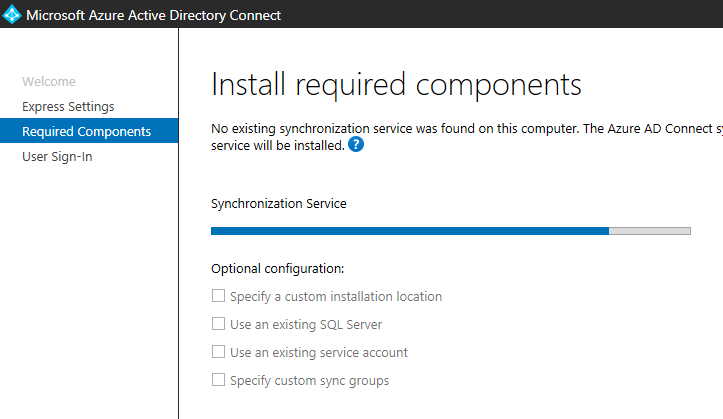 I cleaned up the environment by uninstalling Azure AD Connect completely from the on-prem server, deactivating synchronization in the Office 365 portal (this can take up to 72 hours to take effect), and then deleting all users that had synced from the on-prem Active Directory from the last post. 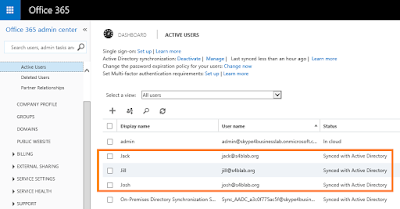 NOTE: You must also delete the users in the Deleted Users section of your Office 365 portal as well, because if you have any same-named users from a previous lab/demo, you can run into issues where password writeback won't work due to duplicate entries. 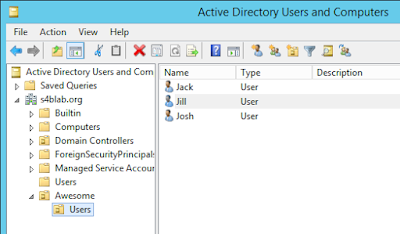 You cannot purge the Deleted Users from the Office 365 Admin portal; instead, reference this article for how to connect remotely via Azure AD Powershell module, and purging those users: http://jaapwesselius.com/2014/12/10/purge-deleted-users-in-office-365/. Once you have downloaded the Azure AD Connect tool from Microsoft's Download Center, run the AzureADConnect.msi file. You will see the below Welcome screen. Check the box next to "I agree to the license terms and privacy notice. ", and then click the big green Continue button. On the Express Settings screen, click the Customize button at the bottom. On the Install required components screen, leave all the boxes un-checked (unless any of those specific Optional configurations apply to you for some reason), and click Install. You will then see the progress bar as the required components are installed. The User sign-in screen comes up and gives you three options. This time, we will leave the default option selected, Password Synchronization, and then click Next. 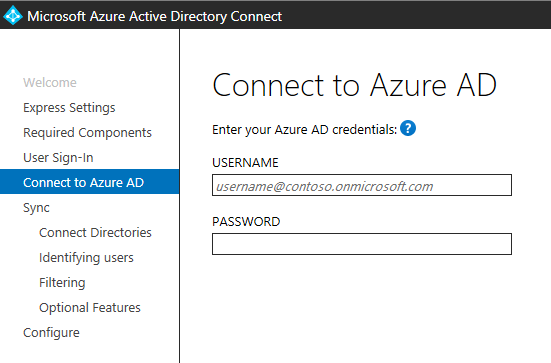 The next screen is the Connect to Azure AD screen. 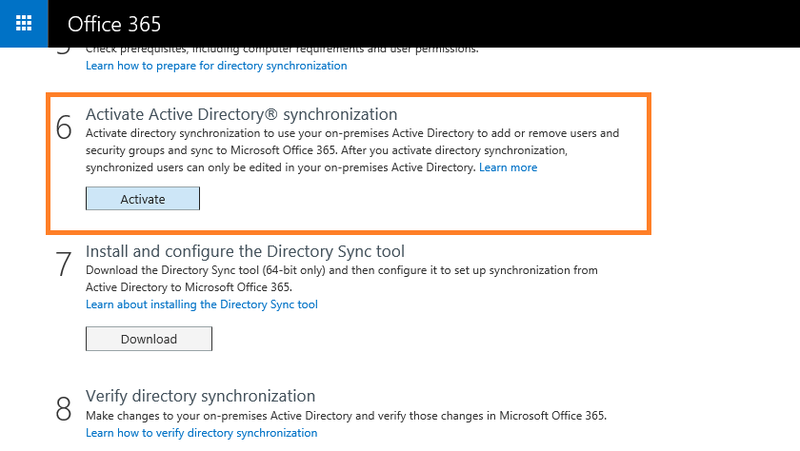 Input credentials from your Office 365 subscription that have the Global Administrator role assigned (preference here is to use an @domain.onmicrosoft.com account, and NOT a user with the same domain name that you are about to sync with), and click Next. You will see your Microsoft Online credentials be validated, and information from your Office 365 environment verified. Next, you will add your on-prem AD domain on the Connect your directories screen. You should already see the Forest field populated. Add your credentials, and then click the Add Directory button. The credentials get verified, and then you can see the directory added. Click Next. Leave the defaults selected on the Uniquely identifying your users screen, and click Next. On the Filter users and devices screen, you can either enter a Distinguished Name or name of a group in AD, and then click Resolve, or you can Synchronize all users and devices. We are leaving the defaults since this is just a demo environment, and clicking Next. The Optional Features screen is where we make our important selections for this post. As you can see, the Password sync box is selected and grayed out because of our earlier selections in the wizard. We will now check both the Password writeback and User writeback boxes (Note, as of the time of this post, User Writeback still shows as being in Preview). Click Next. 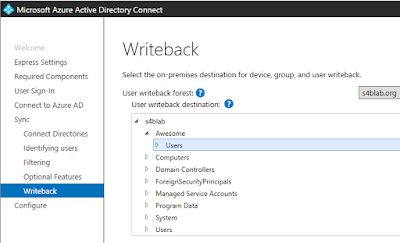 Next we come to the Writeback screen, where we need to traverse the on-prem AD tree structure to select the target Organizational Unit (OU) for User Writeback. Here we have created a special OU for this: The Users OU underneath the Awesome OU, of course! Once you select the desired OU, click Next. Finally, we have the Ready to configure screen. This gives us a chance to review our previous selections. We are going to leave the Start the synchronization process as soon as the configuration completes box checked, and click Install. After clicking Install, we see the wizard make several configuration changes before finally showing us the below Configuration complete screen. Click Exit. 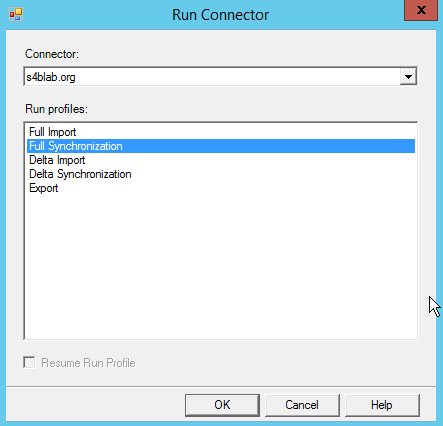 A pop-up box opens up, and we need to select Full Synchronization. Then click OK.
After this synchronization runs, we should be able to see it's successful status in the Service tool that is open. Go ahead and close this tool now, and let's go back to the Active Users screen in our Office 365 Admin portal. Voila! Look at those users! 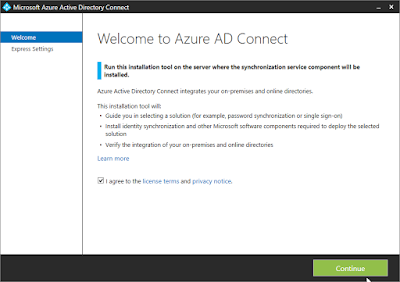 Ok, so, now that our users have synced from our on-prem AD to Azure AD, let's flip that switch. We create a new user called "Cloud Man", and as you can see below, his Status shows as "In Cloud". 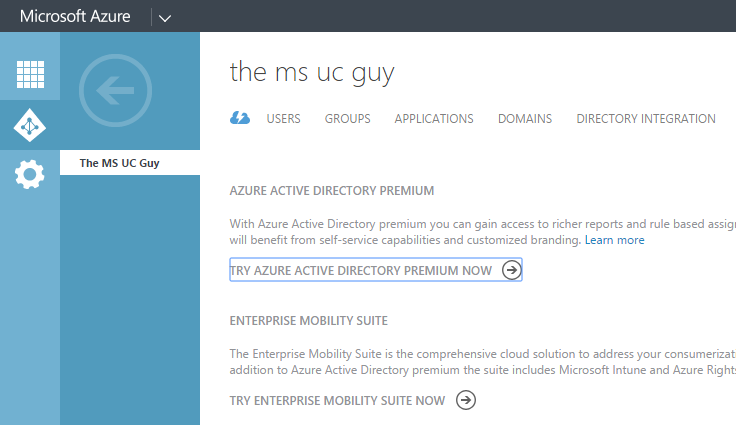 NOTE: when going through the user creation wizard in Office 365, I selected the Azure AD Premium license. Without this, the user would not be able to sync back to the on-prem AD. Alright, time to go check out our on-prem AD and see if this user replicated. If you do not see them in AD yet, you may have to wait for a while before the next synchronization pass. However, after waiting a while, I was able to see Cloud Man in the proper OU (as defined in the wizard earlier. User Writeback is a success! 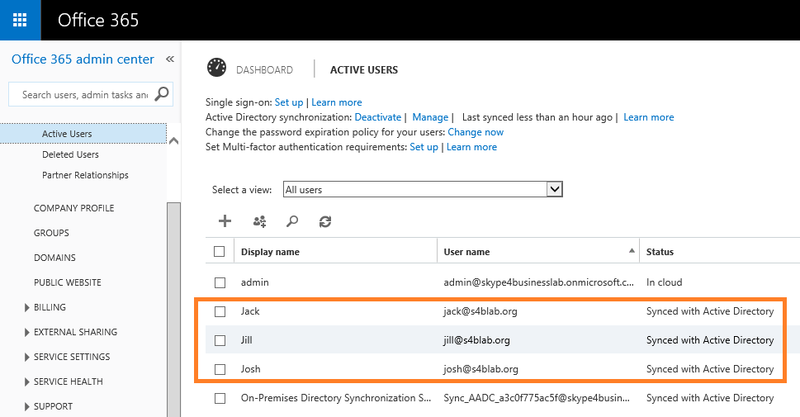 Alright, back in our Office 365 Admin portal, we now need to go to one of the users that we synced from our local Active Directory, check the box to the left of their name, and then click the Edit button under the Assigned license section on the right. In the Assign license overlay, select the user's country from the drop-down list, check the box beside the desired license (in this case we want Azure Active Directory Premium for Password Writeback functionality), and then click Save. Now, with Jack's user object still selected, click on the Reset Password link button in the user actions on the right side of the screen. 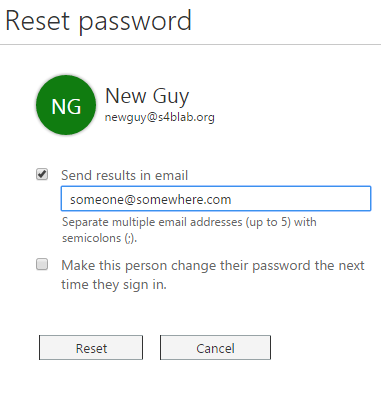 The resulting overlay allows us to specify an email address that the password will be sent to, and we can also choose to require the user to reset their password at next logon. We have left this unchecked for this demo. Click Reset. Once the reset finishes, you should see this reported back as a success, and you will be given the password. 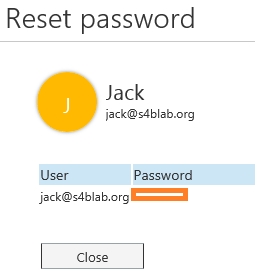 Make note of this password, so that we can try logging in with Jack on our test client VM. Click Close. Now, to prepare our client VM, we needed to allow Jack to logon to the server by adding him to the Remote Desktop Users group on the server, but this is not necessary if you are logging onto a client OS in your AD environment, rather than a VM with a server OS. 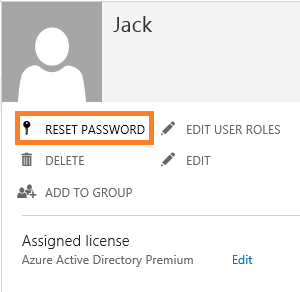 Lo and behold, once I logged in with a new password, I was actually prompted to change my password (the one issued from Azure AD was a temporary password since it was done by the administrator, and not by the user themselves via Self-Service Password Reset). Amazing! 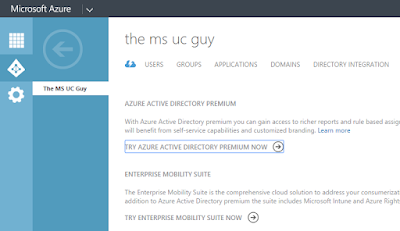 In summary, Azure AD Premium licensing is freakin' awesome! The new feature set that opens up to Office 365 hybrid users is incredible, and I have just scratched the surface (barely!). Don't take my word for it, though. Dig in, and open up a new world of hybrid goodness to your organization! Can you please confirm user writeback function is still available as of 21/9/2015? 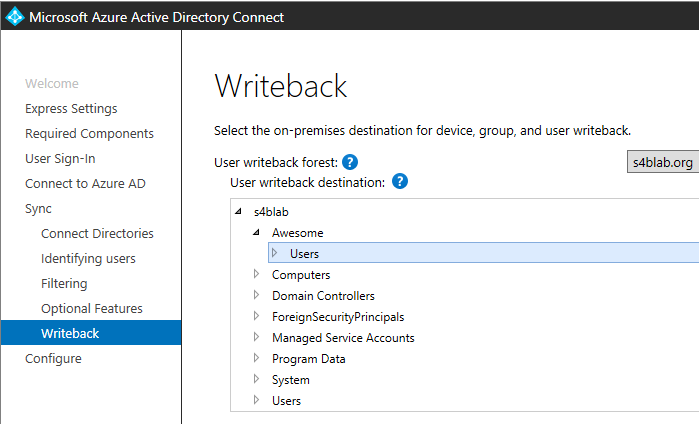 On my side with the lastest AD connect the group writeback is there but user writeback is not even on the options. While I cannot find any official announcement from Microsoft on this, it would seem that User Writeback did not survive past Preview, at least for now. 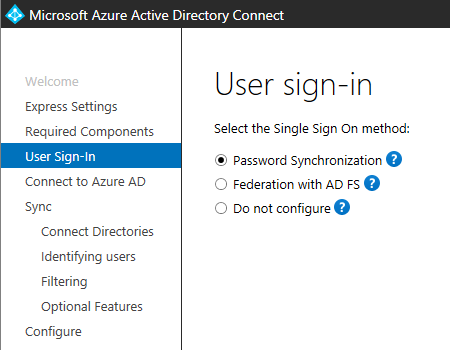 Even their How-To doesn't reflect this option anymore: https://azure.microsoft.com/en-us/documentation/articles/active-directory-aadconnect-get-started-custom/. Too bad. We'll have to keep an eye out for it as a possible future release. Thanks for calling this out! Ok, got an answer from Nasos Kladakis (@Akladakis) on Twitter: https://twitter.com/AKladakis/status/654055245102747648. He is apparently an Azure AD Product Manager at Microsoft, so I would assume this is good info. Looks like User WriteBack WAS in Preview, but is no longer, and should be GA sometime in the future. Interesting. Rogier, thank you so much for that follow-up! So glad to see that they finally put something official out there to answer people's questions. Only about 6 months later, right?! Thanks again. i am curious, with user write back (whenever it becomes available) can i edit/remove users that are mastered from on premise AD? 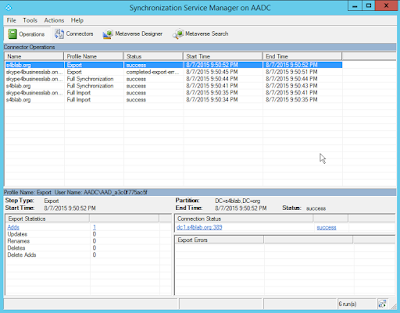 or can i only edit the users added to AAD then written back to on prem AD? or would i assume that the same dirsync edit user model is still used? Ah, always a pleasure to have another Josh drop in for a comment! Unfortunately, I am not really able to answer your question with much certainty. Once the Preview feature was removed, so was any documentation that alluded to it. With that being the case, and given the nature of how they had to pull this feature from preview to revisit some aspects, it is really a big question mark as to what it will look like when it finally comes to market. 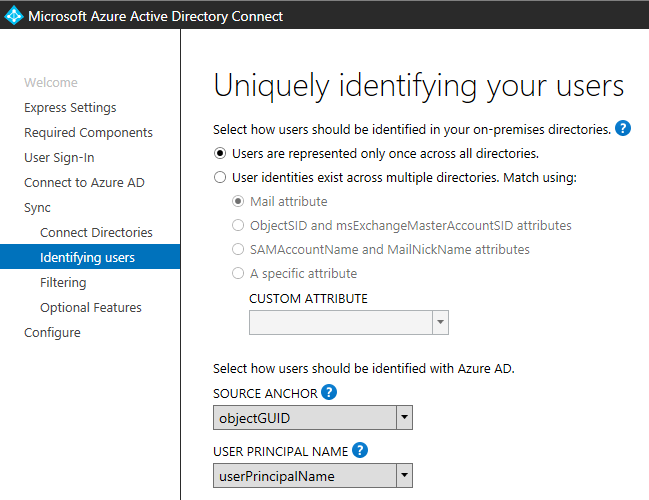 If I had to guess, I would imagine that there will be certain attributes of the on-prem-created user that would be able to be managed in AAD, but full control over all aspects (deletion, etc.) would likely have to be initiated on-prem. Again, this is just a guess. We kind of just have to wait to see what Microsoft gives us when they finally release the feature again. Thanks for reading, and for your comment! Thanks, Nasreen! Very kind of you to say! 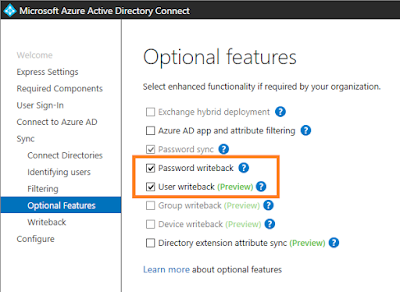 password write back will work without Azure AD premium subscription? Thanks for the write up. 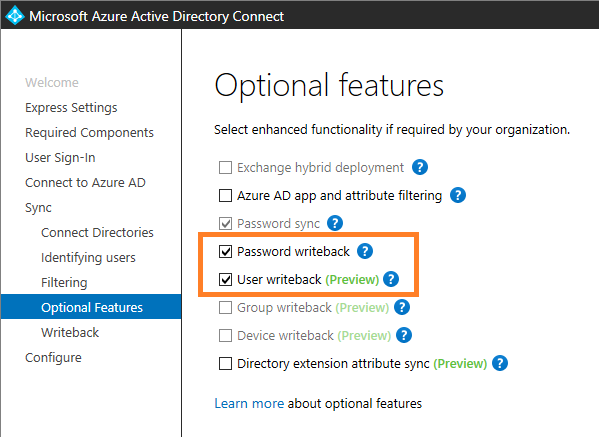 Do you have source of AZURE AD Connect version which has user writeback option. This is really great job. Thank you. This is really informative. Thanks for taking time to share this with us. Looking forward to learn more from you. Really good information. your information is content with image is really clear to observation..
Great Post and it helps us a lot. Thanks for sharing with us. Really appreciated. Failure is not an option, starting out on the right path is. A vast majority of business failures are a result of not knowing the simple steps you can take to steer clear of inevitable obstacles we all face as like it Don't start your journey in the wrong direction. Follow these simple steps towards SUCCESS! reading here. Thanks once more for all the details.